If you have more than one hosting account with Doteasy, you can setup a free Doteasy Master Account for consolidated management. The Doteasy Master Account system features centralized account management. It offers you a simply way to manage and edit your domains’ contact and billing information – one dashboard, one set of logins. Once you’re logged in, click on the Master Account tab on the top. Click Create a New Master Account. Fill out the Master Account creation form as per instructions. When ready, check the I agree to the Terms and Service* box and click Create. Once you’ve created your Doteasy Master Account, you can use the Add Domain+ function to link your existing Doteasy accounts to your new Master Account. 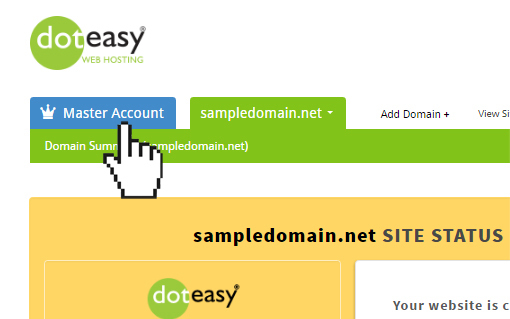 You can also register new domain names or transfer an existing domain to Doteasy.